It's a big week for the Michigan Football program. Even in the midst of the Tigers' playoff run, there's still plenty of hype going on around this weekend's matchup in Ann Arbor. Let's take a look at some of the mid-week headlines making the rounds by the more legit media outlets. 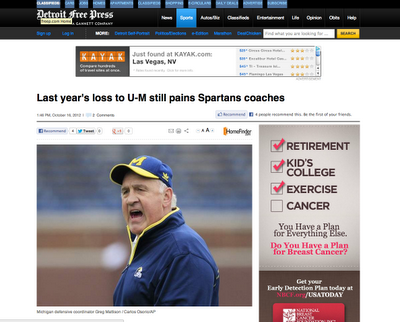 First though, a headline from the future via the Detroit Free Press. File photo from 2010 UM-MSU post-game. This article speaks to the only reason why I actually like Mark Dantonio. Say what you will about the guy, but it's easy to know where he stands on something. He's not a politician. He's the anti-Tressel. When he beats you, he does it with an attitude. When Tressel beat you, he did it while praising you. 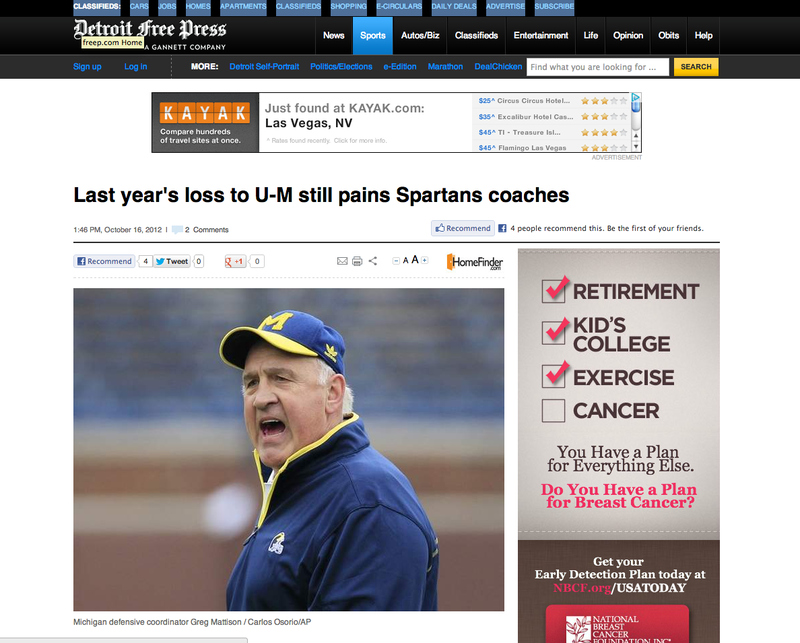 Hence, why many Michigan fans couldn't stand the senator. 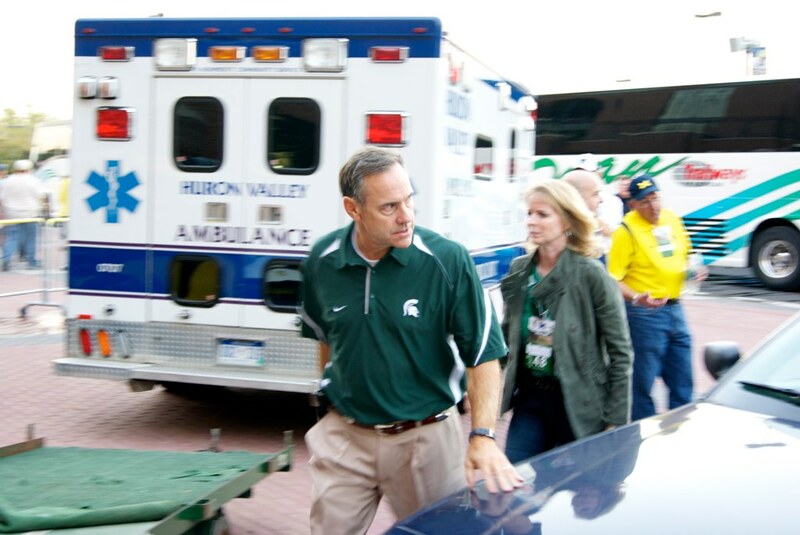 "I have a great deal of respect for Brady Hoke," Dantonio said. "I think Brady Hoke handles himself at times much better than I do, OK? I have a great respect in how he handles his job, how he's gone about his business there. I just go about mine and hope that other guy doesn't come out." Dantonio wasn't exactly referring to an alter ego, but there have been times he's let his emotion surrounding the rivalry get the best of him, often angering Michigan fans while firing up the Michigan State crew. "I'm from Ohio, that's why beating Michigan is such a kick for me. We will continue to do that. … I promise you that." He said it during a coaching clinic in Ohio, and Dantonio explained it was that "alter ego" coming out. "The other guy was there," he said with a smile. "The other guy was talking, I don't know." I think the "other guy" is really just who Mark is. He's raw. He has an attitude and it's reflected on the field in his players. And I have no problem with that, as long as it's clean and doesn't cross that line. The problem is, it does cross that line...quite a bit. File photo via 2011 media day. Demens had the kind of day against Illinois that you would expect a senior linebacker to have against a hapless B1G offense. It was a career day for him. And it sets him up nicely going into this week's game against Michigan State. "Going out as a senior and ending that streak, it would mean a lot," he says. "I want this game more than anything. I think Demens speaks to the thoughts of every senior in the Michigan locker room. They've overcome the lows of the RichRod era. They beaten Ohio State, they beaten Notre Dame. They've gone to a major bowl and won. Michigan State is the next on that list. Then a Big Ten championship. Then a Rose Bowl. Most Michigan players, by design, have refused to talk about last season's game against Michigan State -- or any of the four during the losing streak, for that matter. But a player like Demens just can't seem to help himself. He's from Michigan. He'll always be from Michigan. And this game will always mean an awful lot. "This isn't what I was used to growing up," Demens said. "Hopefully, Saturday, we'll be able to change that." Rawls TD run versus Illinois. Borges said Tuesday that Toussaint remains the starter for Saturday's game against Michigan State, but Rawls has "earned a right to get in there a little bit more. I'll say that." He should say that. After Michigan had 1st and goal early against Illinois and failed to punch it in twice with Fitz up the middle, I would think that would get Rawls some more consideration in situations like that. Rawls got his biggest action of the season in last week's 45-0 win against the Illini. He rushed four times in the first half and nine times for the game. He racked up 90 yards, including a punishing 63-yard touchdown run in the second half. 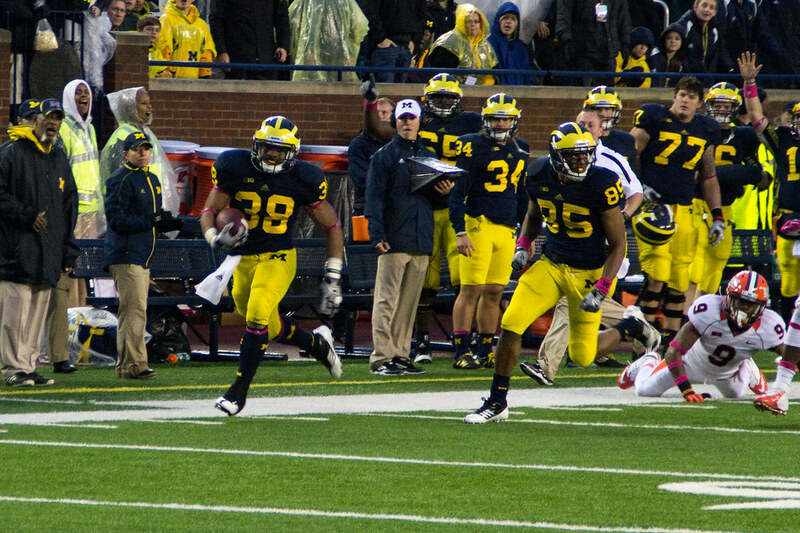 It was the best performance of the season for a Michigan tailback. More importantly, Rawls picked up valuable game experience that should help pave the way for him to see the field more often. "We're lucky in that Thomas has started to surface," Borges said. "It gives us more depth, which is really good news." Borges said redshirt freshman Justice Hayes, who received a career-high 10 carries for 66 yards against Illinois, also is making a case for more snaps. "I think he's a Vince Smith type, only bigger," Borges said. "He does a nice job. He's a good open-field runner. He's got some quickness and some speed. 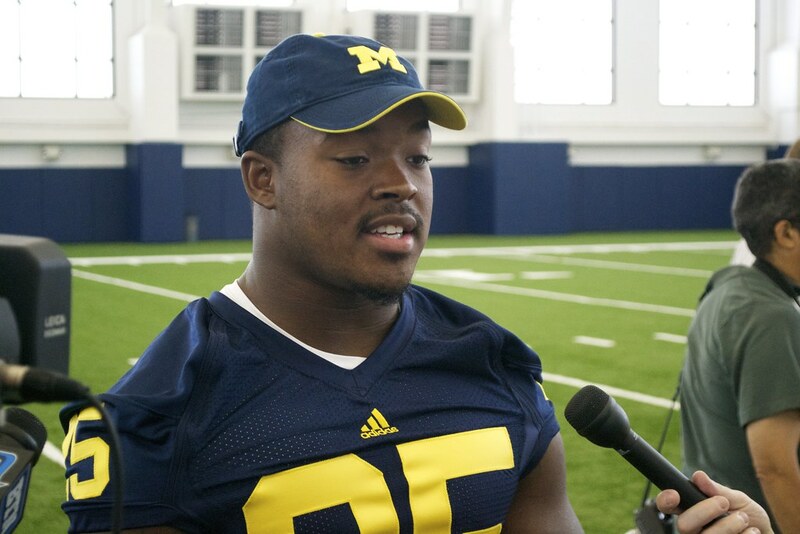 Look, I don't care if they line up Devin Gardner at RB. As long as a "non-Denard running game" starts to emerge from somewhere, I'll take it. We got another scare last week when Denard suffered a "boo-boo" against the Illini – so if it's Fitz, Rawls, Hayes or even Kovacs who can spare Shoelace from getting more banged up than he needs to...I'm all for it.